Can SPR Offset Lost Iranian Crude? Opinions among the big guys in the industry seem to differ. Some say it will bring prices down by a couple of dollars and others doubt it will have any major effect. What say you? SPR has been systematically sold down bit by bit for years now (started by Obama, and currently continued by Trump). The oil would be sold for whatever buyers were willing to pay in a bidding process, not for $28/b. Also the law allows 30 million barrels to be released every 60 days or 500 kb/d. The crude input to US refineries is about 17,500 kb/d on average, so the SPR could provide about 3% of crude inputs to refineries. So let's assume, as you have, that the SPR crude sells for $28/b (that's wrong, but what the heck)and also assume the average input price to refineries is $68/b (without any SPR sales), in that case the SPR release of 500 kb/d at $28/b would reduce the crude input price to refineries to $66.86/b a decrease of $1.14/b. As others have suggested, the effect would be negligible. My sensing of the effect is slightly down on near-term prices but slightly higher on longer-dated futures. Folks have a short memory, so any announced SPR sale would be forgotten the first time there was a strike in Nigeria or unrest in Libya. I guess it's no longer relevant because the US energy secretary said today that the SPR won't be tapped into after all. I think this just means US is leaving 100% control to Saudis. Will Saudis play ball and increase OPEC production or 'be comfortable with $100 oil'? 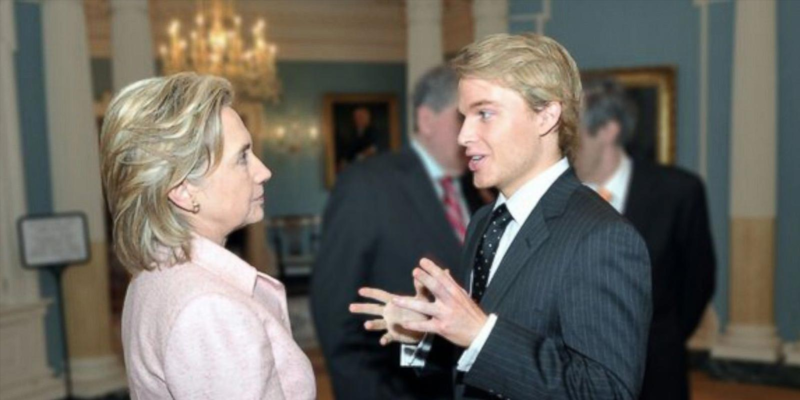 It is my opinion that President Trump believes that the headline in this case may be more important than releasing very much SPR oil, if any. If Rick Perry has explained the limited impact, and if Trump is seen as fighting "the swamp and the Dimms" (their words, not mine) and those darned Arabs to get oil prices down, then he can claim he did all he could for the American people and all they can do now is vote out the Dems in November so they can't stop the good work Donald is doing for them in the future. Never forget, no matter what you think of the man, Donald Trump is a master of media manipulation. One thing is sure about him: he keeps a laser focus on his campaign promises, and the Iran deal was a biggy for him and his base. I don't think he will back down on that. Face it, high oil prices greatly benefit many of his supporters in the oil producing states and industry and he needs to keep them happy too. Rick Perry is perfectly placed and connected to help him with that. At this point I believe oil can go right on up to $90s/WTI and $100s/Brent by the end of the year before WTI makes its way back down to the $60s or $50s by next summer. The price the oil is sold at will not be market rates the reason for the emergency sale will be high oil prices therefore to cure that the price will be set to alleviate that and can be as low as the cost price I would suggest for maximum effect, depends on how hard Trump wants to exaggerate the 'emergency' of high oil prices. I can not find the law you state that there is a limit to how much can be withdrawn from the SPR all I could find was statements on US government websites confirming the 4.4 million a day maximum withdrawal rate can you provide a link? In addition I found cases where the law has been changed to allow specific sales merely for deficit reduction and nothing to do with national emergency so it would seem any law is subject to change relatively easily. Subsequent news seems to have made this conversation mute however as the option is being ruled out. Also the oil would simply be sold at less than the current price, not at cost. 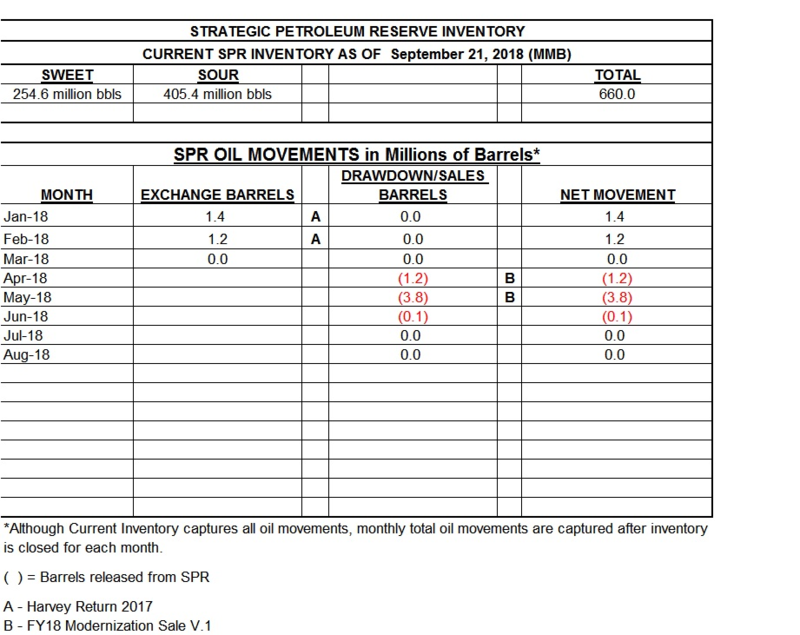 In any case, let's say 4.4 Mb/d were released, bit the maximum was 30 Mb, prices at $68/b would fall to $58/b (if SPR oil is sold at $29.70/b), but the 30 million barrel limit would be reached in 7 days in the limited drawdown case. So the effect would be very limited. I suppose Trump could initiate such a plan on Nov 1, 2018, most people wouldn't realize the low prices will only last for a week. Also lets say we run the SPR to empty over 5 months as in your original suggestion. Then we have no reserve for a "real" emergency. Does that make sense? You do realize we still import about 8000 kb/d of crude oil, right? I think the psychological effect of even hinting of SPR sales would have a short-term (downward) price effect. yes. while it may not have a true impact on inventories, it would definitely have an affect on sentiment. there is some nuance here. "Trump administration is not considering a release from the U.S. emergency oil stockpile to offset the impact of looming Iran sanctions"
the us is indeed releasing spr barrels as part of a planned release per Congress. this is what they have been talking about for months. some outlets have confused the issue by insinuating the administration was releasing the barrels to lower the price of gasoline prior to elections. that morphed into releasing the spr to lower gas prices that are high due to Iran sanctions, which morphed into releasing spr to make up for lost Iranian barrels as a result of sanctions. spr is being released. Congress ordered this a long time ago. But events are not intertwined with Iran or high gas prices. new headline today is a bit disingenuous if I understand the situation accurately. it makes it sound like it's not being released at all. that is not my understanding. they are simply not releasing it with the purpose of offsetting Iran oil exports. does anyone else have different facts? You're right, @Rodent. So, then it must be a coincidence. Only I'm kind of doubtful about it being a coincidence. I've yet to find a politician worth my trust. Link wont work for me as I am not in the US I think had this problem before. From your statement though the difference is if there is or isn't an emergency. I suggest Trump will call it an emergency and get lawyers to to back him up he is the POTUS after all and he is the one who declares what an emergency is. Regards the market price being set by the DOE the reason for the emergency is the price of oil due to Iranian sanctions creating a shortage so selling at market prices will not alleviate the emergency and since the reserve is not that big it will have to be sold at as low a price as possible to alleviate the emergency. The DOE will therefore set it at the price required to do that they would be failing in their duty if they did otherwise. Regards the limited drawdown case again I point to the nature of the emergency so the maximum draw will be used otherwise the effect will be too limited. If the law can be changed to facilitate sale of the strategic reserve to prop up the national finances I have no problem seeing Trump changing minor things like maximum draw numbers if that is indeed a law I cannot confirm that, was it on your link I saw mention to it elsewhere? Regards being empty after 5 months that is what the reserve is for, emergencies. The fact the emergency seems fake is not the issue it will be declared to be one for political reasons and then actions will follow. But still IRANIAN SANCTIONS! Even when they announce increased capacity and the fact that they will be able to increase output IF there is an increase in demand, it's still IRANIAN SANCTIONS! The case I gave was using the maximum and the cost of the oil, if they sold the oil for less than cost that would be silly. The emergency is oil availability rather than price, so selling at market price is most efficient from an economics perspective. As I said the US economy was fine when oil was over $100/b from 2011 to 2014, the point is the market will know it is a "fake" emergency. In addition the US is required by international agreements to have a certain amount of oil in a strategic reserve, some can be used as the US currently has more than needed. If it were a "real emergency" such as a major War in Middle East cutting 20 Mb/d out of the World market, then it would make sense to use the reserve as there might not be adequate oil supply, controlling oil prices as Nixon tried to do in 73/74, simply results in long lines waiting for fuel. In a shortage situation the market price should be allowed to rise so that the available oil is used for the most important uses, again basic economics. In a Soviet style economy, prices are controlled and there are constant shortages and people wait around in line to try to get the goods that are in short supply, a very inefficient system. I have had a look further online and found a book by the US Congressional Budget Office which states there is no fixed plan for how the sales will work. So prices lower than market is an option. There is even mention of using the futures market at one point. Specifically, assume that the government chooses a volume to release (for the volume-setting process), a release price (for the single price-setting process), and a price-volume relationship (for the multitier price-setting process) so that the government can sell SPR oil at the same price using all three mechanisms………………. In sum, any decisions about what type of sales mechanism would be most effective should reflect an assessment of the relative benefits of each process-in terms of its contributions both to lowering oil prices and total oil imports as well as the subsequent benefits of those changes for the overall performance of the economy. Those benefits may differ depending on market circumstances. Regards US economy being fine at over $100 4 years ago maybe different now. Many industries may have got used to the low prices and it is causing them problems, I am sure the farmers will complain if asked just to save some money, add in the fact a lot of industry is now having to relocate to the US it adds in many new consumers of oil products who need low prices to compensate from having to return to the US. In the end Trump can argue many reasons that the US is in an emergency as he is the POTUS. He is good at arguing against most conventional wisdom on many fronts and then acting on his conclusions without anyone stopping him which I believe would be the case here. Cant find anything on international agreements stopping Trump from selling as much as he wants unless The 1975 Second Sinai withdrawal document signed by the United States and Israel which states ‘in an emergency the U.S. is obligated to make oil available for sale to Israel for a period of up to five years.’ I cant see that being enacted personally. Bryan Mound - holds 235.5 MMB in 20 caverns - 68.0 MMB sweet and 167.5 MMB sour. Big Hill - holds 153.1 MMB in 14 caverns - 64.6 MMB sweet and 89.5 MMB sour. West Hackberry - holds 200.1 MMB in 22 caverns - 104.2 MMB sweet and 96.7 MMB sour. Bayou Choctaw - holds 71.8 MMB in 6 caverns - 18.9 MMB sweet and 51.8 MMB sour. Current days of import protection in SPR - At the current level of 695 million barrels, the SPR holds the equivalent of 143 days of import protection (based on 2016 net petroleum imports). Note: The maximum days of import protection ever held in the SPR is 143 days. International Energy Agency requirement - 90 days of import protection (both public and private stocks). In past years, the United States has met its commitment with a combination of SPR stocks and industry stocks. The days of import protection may vary based on actual net U.S. petroleum imports and the inventory level of the SPR. NEW YORK, Aug 20 (Reuters) - The U.S. Department of Energy (DOE) is offering 11 million barrels of oil for sale from the nation’s Strategic Petroleum Reserve (SPR) ahead of sanctions on Iran that are expected to reduce global supplies of crude. The delivery period for the proposed sale of sour crudes will be from Oct. 1 through Nov. 30, according to Monday’s notice. The U.S. government has introduced financial sanctions against Iran which, beginning in November, also target the petroleum sector of OPEC’s third-largest producer. The sale appears to be designed to show the Trump administration is taking measures to restrain energy price increases ahead of the sanctions, one crude trader told Reuters. U.S. crude was up by 45 cents at $66.36 a barrel in afternoon trading on Monday. As a shale boom helped domestic oil production hit an all-time record this year, U.S. lawmakers increasingly have viewed oil-reserve sales as a way to reduce deficits and fund government operations. U.S. President Donald Trump complained this year that oil prices are “artificially very high” and a potential release from the SPR, ahead of the U.S. midterm elections in November, was widely seen as a way to bring relief to motorists who have seen gasoline prices jump in the past year. However, American drivers are unlikely to see prices at the pump fall by crude releases from the SPR because U.S. oil production already is sky high, analysts have said. Still, prices could temporarily dip thanks to seasonal factors. “The well-timed release may, optically help Trump achieve his goal of lowering domestic gasoline prices ahead of midterm elections given that the fall shoulder season is typically when retail prices fall and refiners head into turnarounds,” said Michael Tran, commodity strategist at RBC Capital Markets. Earlier this year, the DOE sold about 5.2 million barrels of oil from the SPR to five companies including top refiners Valero Energy Corp and Phillips 66. Offers for the latest sale are due at 2:00 p.m. Central Time, Aug. 28, the notice said. SPR crude oil samples are not available prior to deliveries, the DOE said. Three firms that bought crude oil last year from U.S. emergency stockpiles raised concerns about dangerous levels of a poisonous chemical in the cargoes, Reuters reported in March. All three firms bought cargoes of SPR oil stored in an underground salt cavern in Bryan Mound, Texas last year. The last sale of SPR barrels was done @ a price of WTI cash + $1.50-$1.70/b FOB , so you can see it is not being sold for under the prevailing market values but a premium. The SPR crude sold under such "crisis" events can lower the price in the domestic market for a short and limited time. There is also a lag in the effect of the sale and release of the SPR crude into the market on the price of crude and products, and who buys it, where that oil will be transported and refined and what the refinery will blend these barrels with in their refining throughput. It may bring a psychological drop of a few cents to a dime maybe a gallon in the price of gas/diesel and some drop in crude price. In cases of real emergencies, like hurricanes etc it can have a longer lasting impact on pricing. The US Department of Energy has sold 7 million barrels of sweet, government-owned crude oil to at least five different companies, according to market sources. The oil, which was sold from three of the Strategic Petroleum Reserve's four sites along the US Gulf Coast, sold for prices between WTI cash + $1.50-$1.70/b FOB, according to sources. The crude was sold to Atlantic Trading & Marketing, Phillips 66, Marathon Petroleum, Motiva, and Trafigura, according to sources. Phillips 66 was sold the largest amount of crude, sources said. The five companies did not immediately respond to requests for comment Tuesday. The DOE announced the sale on March 8 and bids were due by March 21. The agency has estimated that deliveries of the crude will take place in April and May. A DOE official declined to comment on the sale since results have not been made public. The official said that contracts will be awarded to successful offerors no later than April 6. The sale offered up to 3 million barrels from the Bryan Mound site in Texas, up to 2.5 million barrels from Big Hill in Texas, and up to 1.5 million barrels from West Hackberry in Louisiana. The sale is the latest in nearly 30 planned SPR sales mandated by Congress through fiscal 2027 to pay for modernization of the SPR system, government budgets and unrelated legislative efforts. More than 300 million barrels of government-owned crude is estimated to be sold from the SPR between fiscal 2017 and fiscal 2027. The SPR crude oil sale will not do very much to ease global crude supplies. If all of Iranian oil is cut off from the market then OPEC producers and non producers will jump in to grab the market share. However, what it will do is perhaps ease crude supply issues along the USGC and other regions of the US where buyers can either use coastal tanker to supply coastal refineries, use barges and pipelines to supply US refineries. Given the fact that the US shale production is @ an all time high, and since the US isnt importing as much Mid-East crude as it was at one ti,e, the Saudis, Q8i's, UAE and others can fill in the gap of Iranian shortfall. And another fact that since the US can export its crude production, that will also help cover for missing Iranian barrels. Given the number of DUC's (drilled but uncompleted wells) in the Permian etc, shale is now considered a swing production area, so US producers can spring into action on a short term basis to try to fill the gap. Since Japan and S. Korea have stopped buying Iranian barrels, they are looking to US barrels. The US can very possibly step up production and supply both domestically and internationally in a balanced manner to a degree. SPR is there for emergencies and recent laws that permit the SPR to sell certain volumes also make sense if the replacement barrels can be replaced @ no higher costs than what they were acquired for originally. OR the SPR can do swaps with US oilcos....... but that is getting into a different business and trade arena, a subject matter for other issues.